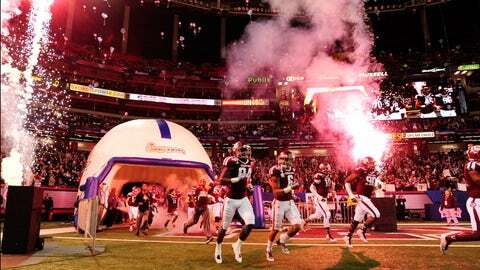 The Chick-fil-A Peach Bowl will host its first national semifinal game in 2016. ATLANTA — The BCS title game will be largely remembered for Jameis Winston’s final drive as a back-and-forth between Florida State and Auburn saw Jimbo Fisher’s reclamation project end with a championship. But of equal importance is what it signaled: a new dawn for college football. The playoff era is here, a seismic shift that sees the Chick-fil-A Bowl, a game that nearly went bankrupt, moving to the forefront of the proceedings. Rebranded as Chick-fil-A Peach Bowl, it is one of the six bowls in the rotation for the national semifinals. Atlanta will first host one of those games in 2016 and then again in ’19. The city is also planning on bidding for the title game in ’18 to be played in the new $1 billion home of the Falcons. "To think the old Peach Bowl is in the same sentence with bowls that are 80-100 years old like the Orange, the Rose, the Sugar, the Cotton is an amazing accomplishment by a lot of people," said current bowl president and CEO Gary Stokan. Stokan was in his first year working with the bowl in 1985 — the game was at the time operating as the Peach Bowl — when Army and Illinois played in front of a such a sparse crowd in a driving rain at that CBS subsequently pulled the TV deal. "I was volunteering hanging sponsor banners up in Atlanta-Fulton County Stadium," Stokan said. "Obviously, the weather didn’t ever seem to be conducive on Dec. 31 when, for the most part, (the game) was played." From the brink of extinction to a seat at the VIP table. It’s a staggering turnaround that ultimately was a culmination of key strategic plays. It began in 1992, when previous bowl leadership aligned with the ACC and SEC and moved the game to the Georgia Dome and then the game increased its profile in adding Chick-fil-A as its title sponsor. That pairing only got better in 2002 when the Stokan and Co. elevated their ACC pick, giving them first choice after the BCS selected. It in turn allowed the bowl to negotiate a new television deal with ESPN that gave it an unopposed prime-time slot on New Year’s Eve. "I think people saw what we were able to succeed due in large part to the ACC and SEC teams, fans — not only the fans of the schools from their cities but the fans in metro Atlanta," Stokan said. The latest fruits of that deal was Johnny Manziel and Texas A&M’s epic 52-48 comeback win over Duke, which was the most-viewed non-BCS bowl game in ESPN history. It drew an average of 8.69 million viewers, surpassing the ’13 Chick-fil-A Bowl’s mark of 8.56 million viewers when it featured LSU and Clemson. "When we selected Texas A&M and Duke, we knew we had one of the most compelling match-ups of the season," Stokan said. "The dramatic game of record-setting offense was equally as exciting for fans attending as it was for the fans at home, thanks to our unopposed time slot in primetime on ESPN." But beyond a well-received and much-anticipated game, the bowl’s success and the partnership with Chick-fil-A also allowed Atlanta to attract the College Football Hall of Fame (which opens in the fall) and revamp the season-opening kickoff game. Starting in ’08 with Alabama and Clemson, the Georgia Dome will host two games in with Ole Miss vs. Boise State on Thursday, Aug. 28 and the Crimson Tide against West Virginia on the 30th. "Recruiting the Hall of Fame to Atlanta and getting the Kickoff Games changed the perception of our bowl and our organization," Stokan said. "In the commissioners’ minds across the country, I think really differentiated us from other bowl games because of our commitment to college football." Coming off a ’77 game that drew 36,733 with North Carolina State and Iowa Sate, then-director George Crumbley was looking at a pivotal season. For the first time in the game’s 11-year history, it had a TV deal. But with ticket sales lagging for a matchup of Purdue vs. Georgia Tech, Crowley said "If we don’t sell 6,700 more tickets, I would say the Peach Bowl is a thing of the past." That game, played on Christmas Day, drew just 20,277, but the bowl survived. Now, behind some key maneuvers, the Chick-fil-A Peach Bowl has moved to the forefront of college football’s new age.